A blast which ripped through a colliery in north-east China is now known to have claimed 134 lives, with 15 miners still trapped underground. A total of 221 workers were on duty when the explosion hit the Dongfeng mine in Heilongjiang province, on Sunday night. Authorities say the blast occurred when coal dust caught fire, knocking out the pit's ventilation systems. 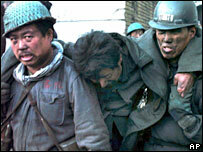 China's mines are considered the world's deadliest. This year alone, 3,000 deaths have been reported. The explosion was reported at about 2100 local time (1300 GMT) on Sunday, the provincial coal mine safety administration told the Xinhua new agency. The mine is run by Heilongjiang Longmei Mining Group, a state-owned conglomerate. The China Daily newspaper says that following a drive to increase safety, 9,000 illegal coalmines have been closed down since September and almost 13,000 dangerous ones suspended. But the paper admitted that the central government's attempts to improve safety were being compromised by local authorities ignoring unsafe mines because they make money. "We suggest that an accountability mechanism be established immediately for provincial and county inspectors who conduct safety checks at suspended coal mines. Inspectors should be held directly responsible for any accidents that take place due to poor safety in coal mines he or she has approved," the paper says. More than 130,000 people died in industrial accidents in China last year.